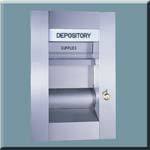 The Night Depositories for envelopes and bags are designed for through-the-wall, walk-up or drive-up use. All Models come standard with capabilities for envelope and bag deposits. A single door provides customer access for both envelope and bag operations. The envelope opening can be accessed without the use of a key. The bag opening is accessed only with a key. The large capacity bag deposit compartment is exposed only when the required key has operated the lock in the depository frame. Twenty of these keys are supplied with the Night Drop. Choose your chest size. All Business Night Depositories carry the Underwriters Laboratories label and have passed the UL tests involving attack by mechanical tools and the use of sophisticated fishing and trapping techniques. And, of course it meets all the provisions of the Bank Protection Act. High Security Night Depository with TL-15 Chest. Walk Up Business Night Depository with Envelope/Bag Head and lower 48" handle meets ADA height compliance for Straight-in Approach. Drive Up Business Night Depository with Envelope and Bag Head.